This entry was posted in Health & safety solutions on 2016/07/06 by Susan. 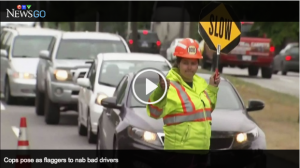 About one in three drivers are on cell phones as they pass through her worksite, says one traffic flagger in this CTV News piece Cops pose as construction flaggers for distracted driving crackdown. “We’re not here to impede your day or make you angry; we’re here to keep you safe,” she says, in the video. According to the video, 14 roadside workers died and 226 were injured at work on B.C. roads over the past ten years. The traffic police in Vancouver staged a roadside sting in support of the the 2016 Cone Zone campaign kick-off. They dressed as workers, which gave them an up-close opportunity to spot and ticket distracted drivers. It’s like “bait flaggers” instead of bait cars or bait lockers, which I’ve seen in the community centres. CTV News was there to get the unique ticketing scheme on video – no doubt adding embarrassment (even public shaming, really) to receiving a distracted driving fine (now starting at $543 for a first offence). The annual Cone Zone campaign raises awareness about the dangers faced by roadside workers. “Roadside worksites involve hundreds of activities, not just road construction,” reads the Cone Zone website. I expect that getting the fine hurts enough, and then being taped for TV news is salt in the wound. But it’s perfectly legal to video people in a public place, so these drivers get what’s coming to them for being so selfish. Good!